Surprise teammates Tenjum, Sochůrek, and Ingram menace DC. Follow live streaming video coverage of the Grand Prix on twitch.tv/magic! THE HASHTAG FOR GRAND PRIX WASHINGTON D.C. IS #GPDC. JOIN THE CONVERSATION. Of our original 539 teams, 69 returned on Day 2 to build another trio of Dominaria Team Sealed decks and battle through six more rounds, vying for a place in the Top 4 and, for many, a Pro Tour invite.GP DC is the final weekend in which players can qualify for Pro Tour 25th Anniversary. The feature matches at GP DC reflected the depth of talent and skill in the room, as pairings like Cox/Scott-Vargas/Baeckstrom versus Damo Da Rosa/Froehlich/Stark and Rubin/Hayne/Sigrist versus Kassis/Soorani/Walker hit the feature match area. Andrew Tenjum, Petr Sochůrek, and Peter Ingram were a surprise team amongst a Top 4 of consistent friends and teammates. Though they’re all individually accomplished players, they didn’t exactly plan on being a team in DC. The team’s origin story was in a handful of tweets bringing together the three players, since they were all without team heading into the tournament. Sochůrek walked into the hall on Saturday morning and started asking if people knew what Tenjum and Ingram looked like, since he didn’t know. But that didn’t keep them from taking down the tournament in a pair of tense and thrilling Top 4 matches. Welcome to Day 1 of GP Washington DC! It's an unusual second Team Limited event for Dominaria, and the last GP to feed into the hallmark team event of the season, Pro Tour 25th Anniversary. And that’s not the only thing drawing teams from all over the world to the Dulles Expo Center. 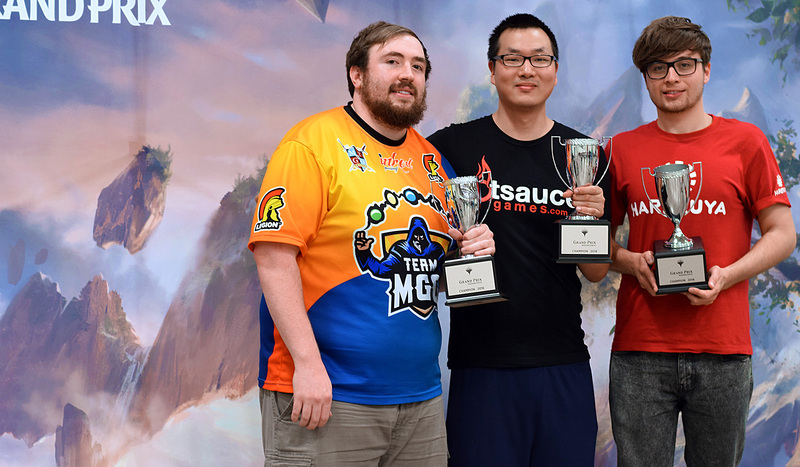 Pro Tour Dominaria is just a week away in nearby Richmond, Virginia, so the field here is stacked with juggernaut (not Juggernaut) players from all over the world forming daunting pro teams like Black/Severa/Hron, two-thirds of the winning team from GP Washington DC 2016, Damo Da Rosa/Froehlich/Stark, all members of the Hall of Fame, Floch/Hendricks/Larsson, a team of two PT winners, the international talent amalgamation of Juza/Nakamura/Burkhart, and the classic Turtenwald/Jensen/Duke, winners of two team GPs and in the Top 4 of five others. Over 500 teams pack the Dulles Expo Center, eager to see what their Dominaria boosters and the rounds ahead of them hold. Legends live again as Karn, Jhoira, Teferi, Squee, and more battle their way through the Grand Prix, bringing their literally timeless amounts of experience to bear on the multiverse. At the end of Day 1, only two teams remained undefeated, leading the pack as all teams with a 6-2 or better record return for another six rounds of Sealed before the Top 4. Join us tomorrow to catch the exciting conclusion, at twitch.tv/magic!